The Baby Trend Snap-N-Go EX Universal stroller disappointed us with a strap installation system that we worry will go undone leaving the baby in a potentially dangerous situation. The Baby Trend is a dedicated frame stroller designed as a universal option for almost any infant car seat brand. It is relatively easy to use and attach car seats, but features like dual action brakes, limited storage bin weight capacity and dual plastic front wheels make it a stroller we aren't crazy about. We understand that the price is appealing, but the features and performance simply aren't. The Baby Trend Snap-N-Go EX Universal is a frame stroller that works with almost any infant car seat on the market. This basic stroller has a "net" comprised of two adjustable straps that support the bottom of the carrier with additional straps that secure the seat over the top. The Snap-N-Go offers a storage bin, plastic wheels, a parent console with cup holders, and a simple fold with dual action brakes. While this frame product does work with a variety of seats, the straps make it difficult to use and a potential safety hazard if parents forget or choose not to use them. Each different brand of car seat will sit as a slightly different depth inside the Baby Trend frame. This comparison graph includes the overall scores tested in this review. The information provided below includes details on how the Baby Trend performed during testing. 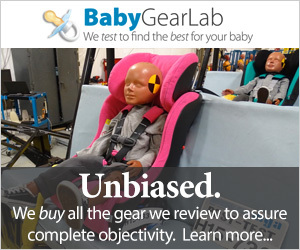 The Baby Trend earned a 6 of 10 for car seat attachment largely because of the attachment method. The photos above show the Baby Trend with the Chicco Keyfit 30, Peg Perego Primo Viaggio 4-35, and the UPPAbaby Mesa (from left to right). There are 2 adjustable straps on the frame of the Baby Trend that support the bottom of the infant car seat carrier. The Baby Trend is a frame stroller that works with most car seats on the market. The car seat attachment works the same for all seats. The frame of the stroller has two adjustable straps at the opening where the carrier sits. The adjustment toggle for the under the seat straps on the Baby trend is hard to adjust and fairly stiff. The first step is adjusting the two straps, so the carrier sits inside the frame without falling too low or sitting too high. The plastic edge of the carrier should rest on the plastic edge of the stroller frame. Adjusting the straps is done with a plastic toggle that is a little stiff and hard to adjust, but ideally, you should only be adjusting it one time. The restraint straps that come from the bottom of the frame and snap over the middle portion of the car seat on the Baby Trend are mandatory parts of the attachment process that must be done for safe installation. Once the carrier is resting in the stroller, there is a second set of straps that must be brought up and over the lower portion of the carrier to secure the carrier to the stroller. If you skip this step, the car seat is not attached properly and is free floating in the frame. Not using the straps means the baby could suffer from injury or potentially death, so parents can't skip the second step. While attaching car seats on this product is not difficult, we aren't big fans. We worry that parents will forgo the second step leaving the carrier unsecured to the frame. Some parents might skip the step thinking the carrier is secure enough, or they aren't "going that far," while others might forget to snap the securing strap or won't know that it is required. We prefer the easier one step click in products where the odds of doing it incorrectly are limited. We tested several different brand car seats in the Baby Trend including the Cybex Aton 2, Chicco Keyfit 30, Peg Perego Primo Viaggio 4-35, Safety 1st onBoard Air, and the UPPAbaby Mesa. Most of the car seats we tried felt secure once properly install with both steps. However, the Cybex Aton 2 did move around a lot in the frame, and while it probably isn't going to fall out, it does have a lot more movement than the other brands we tried. So if you are committed to using the Snap-N-Go, it's probably best to avoid the Cybex Anton 2 combination. While the Baby Trend is the lightest product in the group, it is not the smallest folded option. The Baby Trend earned an impressive score of 9 of 10 for weight and folded size. It is a lightweight stroller but oddly folds into a larger product. We feel the weight and size of are important features to consider when looking for a car seat stroller. Because mom might have limitations after a C-Section that prevents her from lifting heavy things, we prefer a smaller and lighter product for car seat attachment. The Baby Trend meets part of this requirement with a weight of 10.9 lbs, making it the lightest option in the review. Unfortunately, it is large for being the lightest product with an overall cubic size of 8,661 inches. This isn't a super large size, with the BOB Revolution Flex Combo measuring over 14,000 cubic inches, but it isn't as small as the UPPAbaby Cruz Combo that measures at 7,860 cubic inches and only weighs 15.3 lbs. The double plastic front wheel design on the Baby Trend make it harder to maneuver than products with single wheel designs or rubber tires. The Baby Trend earned a 4 of 10 for maneuverability. The high in the group is a 9 earned by the BOB Revolution Flex Combo and the Baby Jogger City Mini GT Combo which both have rubber tires and single front wheels. None of the dedicated frame strollers are easy to maneuver thanks to their smaller plastic wheels. Given that this is not your lifetime stroller, it might not be worth getting upset that it didn't score that well for maneuverability, as it will do fine on hard flat surfaces where most newborns will be traveling. The Baby Trend has small plastic wheels with the double front wheel design we aren't fond of because they aren't the best at staying on track. There is significant flex in the frame that gave us trouble moving over a 1-inch curb and it was better on hard surfaces than grass and gravel where we had difficulty turning. The wheels are small and foam filled plastic and they look like those found on a play stroller. They wobble when pushed and do not rotate well when spun. Compared to some of the competition with rubber tires and ball bearings on the wheel hub, it is easy to see how lower quality materials and design impacts performance. There is also no suspension which means the baby will feel every imperfection and jarring motion. The handlebar is covered in a soft rubber type material that feels good but also seems like it may develop imperfections easily that could grow over time until chunks of the cover are missing. The storage bin on the Baby Trend is limited to 5 pounds maximum, making it relatively useless at carrying a full day's supply of baby needs. The Baby Trend earned a 4 of 10 for ease of use tying with three other strollers. A lot of the features and conveniences that make a stroller easy to use are missing on the Baby Trend, because at its heart it is a frame stroller that doesn't need, nor historically have these features. To fold the Trend you first need to slide the unlock button on the handlebar and squeeze the release button. The Trend is pretty easy to fold with only one hand. It has one to two steps depending, including an unlock and release button that allows you to fold the stroller. The front wheels need to be facing forward to complete the fold and engage the manual lock. The Trend self-stands and rolls when folded, or you can use the carry handle. It unfolds just as easy as it folds. The Baby Trend has double action brakes, which means the brakes need to be set on each side independently. If parents only engage one side, the stroller will not be safely parked. The Baby Trend has double action brakes that require two separate pedals to be pushed to activate. We prefer the single action brakes that only require the push of single pedal to enact both sides at the same time to avoid potential mistakes. The brakes are average for setting and releasing, and they can cause pain to the top of a sandaled foot. The storage bin on this stroller is on the large side, but it has a 5 lb weight limit which will seriously limit what you can put inside. Unfortunately, we were only able to fit in the medium sized diaper bag. This is because access to the bin is not designed well. There is some access from all sides, but because the carrier sits down into the frame, it causes interference with the basket. You will not be able to run errands or go grocery shopping because it won't hold the weight making it somewhat useless for city dwellers. The Baby Trend is one of the few options that come with a parent console. That sounds like a good thing, but it isn't that useful. The cup holders are small and the storage compartment is too small for even a standard iPhone. Also, there is a safety concern with putting bottles or other taller items into the cup holders because they can fall out and onto baby while strolling. There is no canopy on the Baby Trend, and all car seat carriers will need to rely on their own canopy for protection from weather and other elements you hope to shield baby from. The Baby Trend earned a 9 of 10 for ease of setup and took us about 5 minutes to put together. This is all in spite of a poorly designed manual with a hard to find the first step. The pictures in the manual almost make the simple process more difficult. Though it is easy to assemble, it requires more assembly than most of the competition with front and rear wheel assembly and console construction. The Baby Trend Snap-N-Go is a "Universal" frame stroller. The Baby Trend earned a 4 of 10 for quality. The materials and components aren't the best. The storage bin material is flimsy, and it looks like a small cut will easily turn into a larger hole, and may be why it has a 5 lb weight limit. The materials used on the Baby Trend storage bin are not great and it left us feeling like they might tear easily and are certainly part of the reason why the weight limit is so low. The frame on this product is a little wobbly and rattles when you place the car seat on board. The joints are not tight and there is a significant flex in the frame. The plastic on the frame components looks different and potentially of lower quality, and we think it could potentially fade over time. Overall the fit and finish aren't bad, it simply isn't as good as the competition. The components and materials used appear to be of a lesser quality and the way the parts are put together and connected make the stroller harder to use. Amazon $40.05 - 43% off!